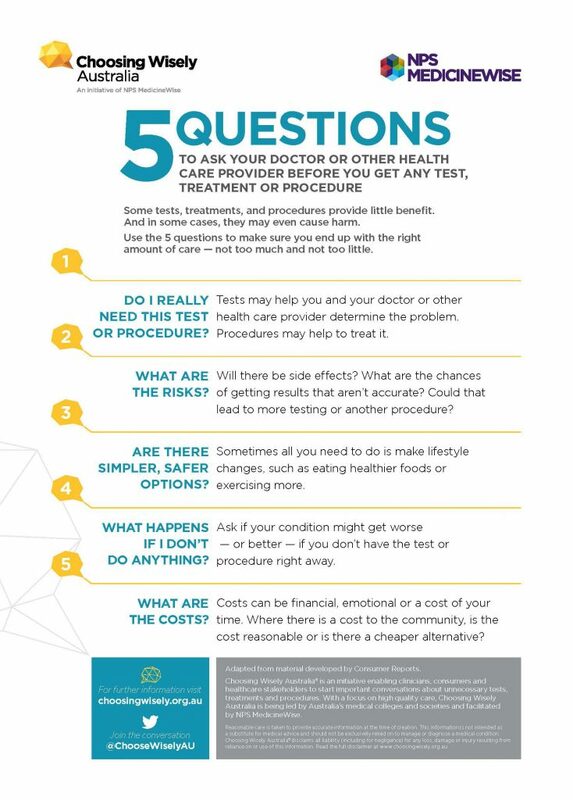 As part of the Be Medicinewise Week initiative, we are promoting the Choosing Wisely Australia resource “5 questions to ask your doctor or other healthcare provider before you get any tests, treatment or procedure”. The resource is recommended to our clients as it promotes valuable conversations about what care is needed, to support better decisions. Some tests, treatments and procedures provide little benefit. And in some cases, they may even cause harm. Use the 5 questions to make sure you end up with the right amount of care — not too much and not too little. The 5 questions you should consider asking your doctor or health provider are now available in 10 community languages (Arabic, Chinese simplified, Chinese traditional, Croatian, Greek, Italian, Korean, Macedonian, Spanish and Vietnamese).